ART. II.----THE CHURCH OF ROME POSSESSES THE FOUR POSITIVE NOTES OF THE TRUE CHURCH. A. THE CHURCH IS ONE IN DOCTRINE.----Throughout the whole world we find the children of the Church chanting and professing the same creed, accepting the same precepts, the same sacrifice, the same Sacraments. And if we go back to apostolic times we find the same identity of doctrine. B. THE CHURCH OF ROME IS ONE IN HER MINISTRY.----There is nothing more palpable or more readily recognized. Unity of faith, which we have just demonstrated, is maintained in the Church by a unique, invariable, and perfectly known ministry. The gentle but firm action of this ministry has its source at Rome, the centre of government, whence it is conveyed by means of bishops and subordinate pastors to all parts of the world until it reaches the humblest members of the Church. The simple faithful are united to their immediate pastors, the latter are united to their bishops, the bishops are united with the Pope, from which they hold their faculties. Thus is the most complicated multiplicity reduced to the most marvellous unity. Here again is a principle which sustains this unity: he who refuses to submit to the authority of the lawful pastors of the Church is excluded from her bosom. History testifies that this unity, which we admire at the present day, has remained unbroken through all the Christian centuries, may vary with circumstances, for they are not a Divine but an ecclesiastical institution: the authority which has established them has a right to abolish or modify them; in fact it must needs vary them according to the exigencies of the times. But the hierarchy, the ministry for the governing and the teaching of the faithful, is a Divine institution. It comes from Jesus Christ, and consequently never varies. Let us observe in passing that the worship and ceremonial also may, for analogous reasons, undergo certain modifications in rites or accessory ceremonies, but it remains in all places and at all times the same in everything essential established by Christ. REPLY.----It is true that during this time the material union of government was disturbed in the Church, but formal or essential unity never ceased to exist. There were not two legitimate popes any more than there are at the present day; but various circumstances made it difficult to discern clearly the veritable supreme head of the Church and caused a deplorable division. The situation, which Catholics acknowledged was contrary to the will of God, was a source of great grief to them. Both sides sought the truth and never desisted until every doubt was dissipated, and the entire Church acknowledged Martin V, elected in 1417 by the Council of Constance. Hence this schism, which is easily explained by an error in a question of facts, in no way weakens our thesis; it proves, on the contrary, the profound spirit of unity which animated the members of the entire Church. No one admitted the simultaneous existence of two lawful heads; all were convinced that there was, and that there could be, but one; but who this one head was remained for a time doubtful. Evidently one part of Christianity erred in their choice; but they erred in good faith, and the obedience of both sides was conscientiously given. It would be difficult to enumerate the legions of holy children which the Church of Rome has borne. Without mentioning Christian heroes of the first ages, where shall we find outside the Church any that can be compared to men like St. Benedict, St. Thomas Aquinas, St. Francis of Assisi, St. Dominic, St. Francis de Sales, St. Ignatius Loyola, St. Francis Xavier, St. Vincent of Paul, St. Elizabeth of Hungary, St. Teresa, and innumerable others? In addition to these Saints of all ages placed upon her altars, who professed no other faith than that of the Church of Rome and whom she alone can claim, she has nourished in her bosom innumerable souls of no less solid virtue, whose sanctity, though hidden from the eyes of the world, equalled that of the canonized Saints. And in our own day, in the midst of the corruption of the world, as many good works and deeds of virtue are performed under the influence of the same quickening spirit as in the preceding centuries. God has been pleased to proclaim at all times the eminent sanctity of the heroes of the Church by the most striking miracles----miracles which can be attributed only to Divine intervention, and which are confirmed by such irrefutable testimony that to question them is to annihilate history and refuse the testimony of reason. For many centuries the examination of miracles has been reserved to the Pope. We find in the capitularies of Charlemagne a prohibition against publishing any miracle before the sovereign Pontiff has pronounced upon it. It is well known how carefully and severely miracles in cases of canonization are tested by the Congregation of Rites under the guidance of the supreme Pontiff. And yet how many miracles have been authentically proved in the last centuries! For example, those of St. Francis Xavier, St. Joseph Cupertino, St. Philip Neri, St. Francis de Sales. The severe and learned Pope Benedict XIV, in the appendix to his great work on the canonization of the Saints, relates the most striking miracles, among others those of St. Elizabeth of Portugal, St. Pius V, St. Andrew of Avellino, St. Felix of Cantalicio, St. Catharine of Bologna, etc. The work of the Bollandists, that gigantic monument to the glory of the Saints, gives abundant proof of the continuity of this Divine testimony in favor of the Catholic Church. We have already stated above the reason why miracles are not as numerous at the present day as in the first ages of the Church. We must bear in mind, moreover, that the miracles of the early ages, being supported by incontestable testimony, are quite as conclusive for us. They proclaim today, as they did then, the holiness of the Church in favor of which they were wrought; they demonstrate that God gives the most manifest approval to the virtues practised in her bosom. Finally, the Church's remarkable preservation and the marvellous results which she continually produces in the world are true miracles and become more and more striking as her age increases. Our own century has not lacked the testimony of Divine miracles. The most exacting critic has only to read the life of the venerable Cure of Ars and writers on Lourdes  to recognize that the power of God still abides with His true children. III. THE CHURCH OF ROME POSSESSES CATHOLICITY. After she took possession of the world through the eight thousand men of every tongue and every nation converted by St. Peter, the Church never ceased to spread and to win new subjects. This we have already seen from our reflections on the rapid propagation of the Gospel throughout the world. At the end of the first century the Church had gone beyond the limits of the Roman empire, and since that time her ascendancy over barbarism continually increased, recovering in one country what she lost in another, and ever finding reproduced in some part of the world the marvellous fruitfulness of her youth. IV. THE CHURCH OF ROME POSSESSES APOSTOLICITY. A. THE DOCTRINE OF THE CHURCH OF ROME GOES BACK TO THE TIME OF THE APOSTLES.----Her doctrine of today is the same as that of the Apostles. In speaking of the unity of doctrine in the Church we demonstrated a complete identity between the oldest creeds or professions of faith, the writings and decisions of the first ages and those of our time. is necessary to show when and how these dogmas were introduced into the Church; this our opponents have never done, and for a good reason. Meanwhile what is stated without proof the Church has a right to deny without proof, for she is in possession. She does not, however, lack proof: she has history to testify how zealously in the first ages popes and bishops opposed all doctrinal innovations. Hence they would have offered the same opposition to the introduction of the important dogmas contested by Protestants. They did not do so, for ecclesiastical history, so watchful in matters of this kind, is silent on this point. Perhaps it will be said that all the members of the Church, pastors and flocks in all parts of the world, agreed to admit without protest such numerous and grave innovations. In the first place, this hypothesis is absurd; in the second, the heretics of that period would not have failed to make themselves heard: condemned as innovators by the Church, they would have seized the opportunity to reproach her with her own innovations. Among the truths attested by tradition alone, and which are not explicitly taught in Holy Scripture, let us cite as examples the Assumption of the Blessed Virgin and the validity of Baptism administered by heretics with the requisite form and matter. B. THE MINISTRY OF THE CHURCH GOES BACK TO THE TIME OF THE APOSTLES THROUGH THE UNINTERRUPTED SUCCESSION OF HER CHIEF PASTORS.----All history testifies to the fact that the sovereign pontiffs have come down in uninterrupted succession from Peter to Leo XIII. [at the time of the author's writing this book.] The popes have always proclaimed themselves before the world the successors of the chief of the Apostles and the inheritors of his supreme authority. The churches [dioceses] in subjection to the Church at Rome and forming one with her show a like series of lawful pastors who hold their mission from the Apostolic See. REPLY.----These facts in no way interrupt the legitimate succession of the supreme heads of the Catholic Church. 1st. During the schisms there was always but one legitimate pope, even though his authority may have been contested in good or bad faith by a part of the Church. If a province revolts against a prince, does he cease to be the lawful sovereign of this province which rightly or mistakenly disputes his authority? As to the great schism of the West which presents the greatest difficulties, we have dwelt sufficiently upon it above. 2d. The sojourn of the popes at Avignon did not prevent their being bishops of Rome and, as such, heads of the entire Church: a prince who lives outside the capital of his government does not forfeit the sovereignty of his country. 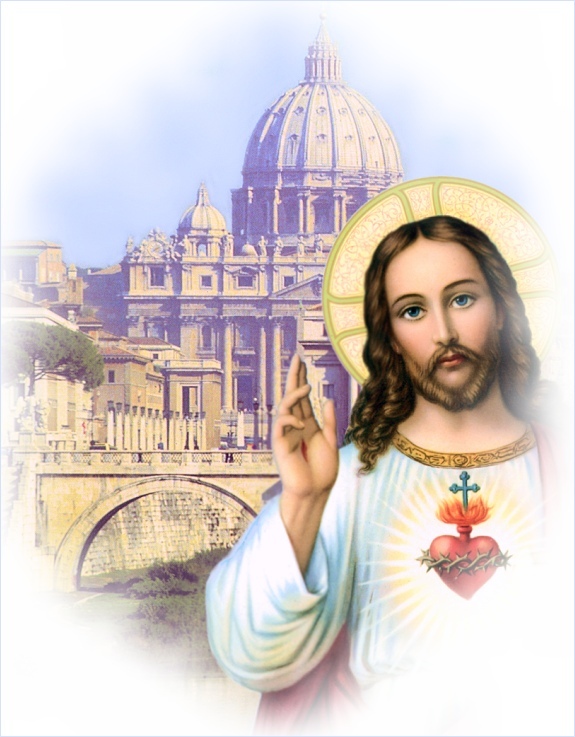 The Catholic Church possesses, then, all the notes of the true Church; and as only one Church was founded by Christ, this Church must be the Church of Rome, whose mission is to lead man to eternal salvation. After the preceding demonstration the two articles following may seem useless. We would add them, however, as superabundant proofs so that they may facilitate the return of erring brethren to the fold of Him Who is the Way, the Truth, and the Life, and Who earnestly desires that there be but one Fold and one Shepherd. 1. Rhodes; Preston; Harper, I., essay 1; Newman, Difficulty of Anglicans, 1. 10, 11; D. R. New Ser. xv.. 458; C. W. lix. 152. 2. Lacordaire, conf. 29, 30, Cath. Doctr. and Society. 3. If dogma is immutable, like truth itself, this immutability does not exclude progress. Progress in the Church is only the development of principles laid down by Jesus Christ. Thus, for example, the Church has declared or defined in three successive Councils that there are in Jesus Christ one Person, two natures, and two wills. These three definitions are only logical developments of one and the same truth, which, under its primitive, its revealed form, was known and taught at all times: Jesus Christ is at the same time true God and true man. The following remarks will illustrate still more clearly the manner in which doctrine is developed in the Church. 1st. There are in revelation a certain number of points which, in the first days of Christianity, were formally and explicitly presented to the belief of the faithful. 2d. There are others which in the beginning were not explicitly given, and were destined, in the plan of Divine Providence, to be developed gradually in the course of time and under the direction of authority. 3d. The history of the latter contains three different periods or epochs. In the first period they are not immediately obvious, either because of their deep metaphysical character, which caused their connection with the principles revealed to remain unobserved, or because of circumstances which do not permit institutions to manifest themselves completely in the first days of their existence, or simply because of the actual impossibility of the human mind to think of everything at the same time. In the second period these truths, which lay dormant in the Christian conscience, began to be agitated; they made more impression than heretofore; they were preached and were presented as new food of piety to the faithful. Then it happened that certain persons contested them, alleged the obscurity of the tradition upon which they rested, and protested against their being considered as part of revelation. 4. Dr. Brann; Rhodes; Preston (Ch. Unity); Spalding, J. M., Miscellanies, ct. 9; A. C. Q. xvi. 67; M. lxxviii. 77, 194; Br. W. vii. 320; Murphy, ch. 20; Parsons, Studies, II., ct. 36,39. 5. Thebaud, The Church and the Moral World; Digby, Mores Cathalici; Ricards, Catholic Christianity, ch. 3 ff. ; Lacordaire, conf. 21, 29, on Cath. Doctr and the Soul, A. C. Q. v. 385, ix. 166, xix. 813; C. W. vii., ix. 529; Br. W. vi. 409. 6. On charges of immoral doctrines and practices see below, ch. 4, art. 10. The Church is holy in her legislation, because its whole object is to insure and facilitate (a) the success of her apostolic mission; (b) the faithful observance of the Divine law; (c) the attainment of higher Christian perfection.----EDITOR. 8. Bowden, The Witness of the Saints; Burnet, Path, ch. 10; Allies, The Monastic Life; Br. W. viii. 219; Scheeben, Sanctity of the Ch. in the XIX. Cent'y. 9. C. W. li. 533; also Oratorian Lives of Modern Saints. 10. Faber, W., Essay on Beatificaton and Canonization; D. R. New Ser. xxvi 1; Benedict XIV on Heroic Virtue (first vol. of Oratorian Lives); Burnet, Path, ch. 6; J. M. Spalding, Evid., 1. 5; Baart, The Roman Court, ch. 5. 11. Dr. Lasserre and Clarke, S.J., on Lourdes; Dr. Lefevre and Card. Walsh on Louise Lateau; the articles in C. W. xiii. 1, xxxix. 835, on the liquefaction of the blood of St. Januarius, liv. 897, on Lourdes, xiv. 171, on Louise Lateau; also D. R. New Ser. xvii. 170; Irish Eccl. Record, Aug. 1900, "'Modern Miracles"; Searle, Plain Facts, ch. 21; Parsons, Studies, VI., ll. 22. 12. Lacordaire, conf. 31, Cath Doctr. and Society. 13. It is only of late years that Protestants have endeavored to claim this title by establishing the fallacious distinction of Catholic and Roman Catholic. But, as the author of "Catholic Belief" observes, "the word Roman does not limit the word Catholic, but completes it, declaring more expressly that which is already supposed in the word Catholic, viz., that the Catholic Church has its centre in Rome." ----TRANSLATOR. 14. Capel, Catholic, etc. ; Austin, Notes on the Catholic Name; C. W. i. 96, 669,741; Spalding, Evid., 1.4; A. E. R., Sept. 1902, Febr. 1903. 15. Marshall, Cath. Missions; Wiseman, Lectures on Doctrines of the Church, 11. 6, 7; D. R. III. Ser. xii., xiii., xvii, xxi. ; Spalding, Evidences, 1. 4. See also above, p. 217 fl. 16. Lacordaire, conf. 1 and 31 on the Church. 17. Humphrey, Written Word, ch. 7, 8; Card. Manning Grounds of Faith; A. C.Q. xii. 409; Walworth, ch.ll; Wiseman, lect. 1-7; Hunter, I., tr. 2, ch. l.
18. " If there is a book," says the learned Le Hir, " to which the key is found in tradition alone, it is the Bible. But here philological tradition is not enough if it be not intimately allied with dogmatic tradition. I would like you to understand how very imperfect, defective, erroneous, and often bizarre is a science of the past that is cut loose from the great tree of tradition The last Phrenician workman, if he came back to us, could teach our greatest experts in the deciphering and interpretation of the texts of his country. In the midst of life, where he once moved, and in the daily exchange of ideas and reports forming a living tradition, he would find advantages and resources which the most profound researches could only imperfectly supply." See also Didon, J.. Ch., introd. pp. xxxiv. and xliv. 20. Lacordaire; conf. 9 on the Church. 21. On the fable of Popess Joan see Dollinger, Fables, etc. ; Parsons, II., ch. 3; Alzog, II., § 185.